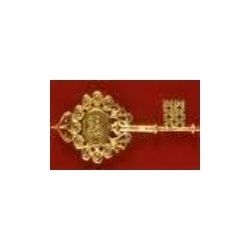 Gold Plated Kuber Kunji - This key should be placed in the places where you keep your money like cash box, almirah, office drawer etc. Kuber Yantra - Put it in the north corner of your house as that is the disha of Kuber. You can also put it in your purse. By placing it in the north of the house it will pull the wealth in your house. When Lord Kuber is pleased then bless the person with material success and wealth. The chances of coming wealth unexpectedly and suddenly through lotteries etc increase. Get the blessings of Lord Kuber by bringing Kuber Kunji pack into your house. After years of research and study of rashees and planets Sri Divya Rishi Sansthan brings to you Kuber Kunji pack. Kuber Kunji will bring about a distinct change in one’s prosperity and luck though, of course, effort remains paramount. This is an extremely powerful pack which is created after a detailed study on rashees & planets. It is also energized by mantras. The owner of this pack will never be lacking money & material comforts. His house & treasury will always be full and he & his family will never have shortage of resources. Kuber Kunji pack should be kept in house temple, cash box, almirah and in offices where financial transactions are made. It blesses the worshipper with money and prosperity by drawing new avenues and sources of income and wealth. It helps increase the flow of funds and the ability to accumulate wealth. Kuber Sadhana ritual shall be performed on amavasya day (day preceding the moonless night) or a sunday morning, before sunrise. One should take a bath and wear clean yellow clothes. Sit on a yellow mat or cloth facing north because north is the direction of lord kuber. Cover a wooden seat with yellow cloth. Take a steel plate and draw a swastik with vermilion. On swastik, make a mound of rice grains. On the rice grains place a kuber idol given in the pack. Around the idol place all the other things given in the pack. Offer the thali to your isht devata & close your eyes and concentrate on the deity to bless you with wishes. Now with all sincerity, ask god to grant you the desire of your life that you wanted to be fulfilled in your own language. Now chant the kuber mantra 108 times.